Stone type: Coarse yellow sandstone. 81'' in height, circumference goes from 81'' to 76''. 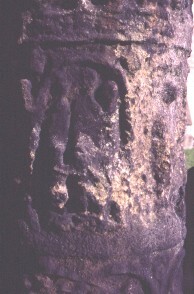 Pillar, third register, dated to early ninth century. The column has four rows of panels running around it. The third row has four panels of figure subjects and three trees.